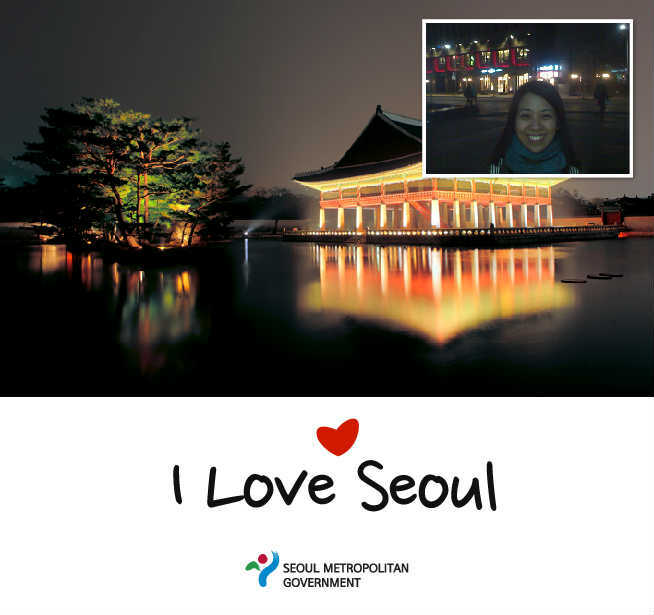 [Seoul] ~ Experiencing the everyday | I am no travel planner. 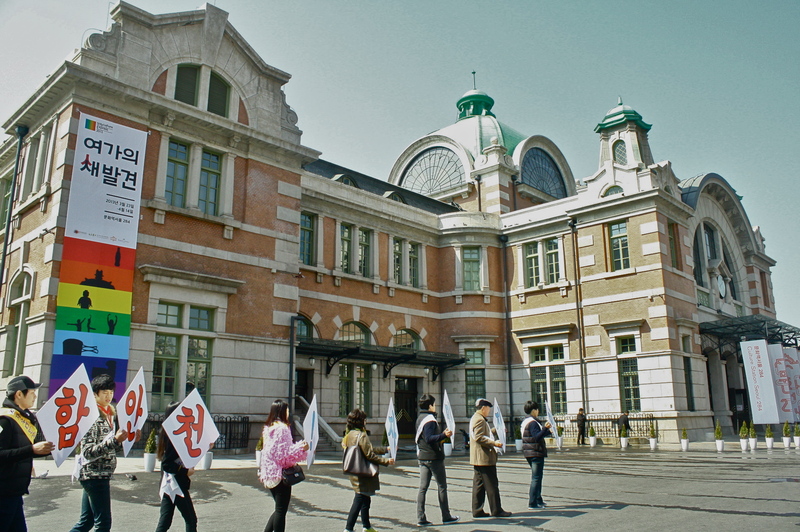 The Old Seoul Station – no longer functional but transformed into a cultural facility. I wonder whether this is a protest or something. I tried to be discreet with the picture because I am not sure if they would mind or not. 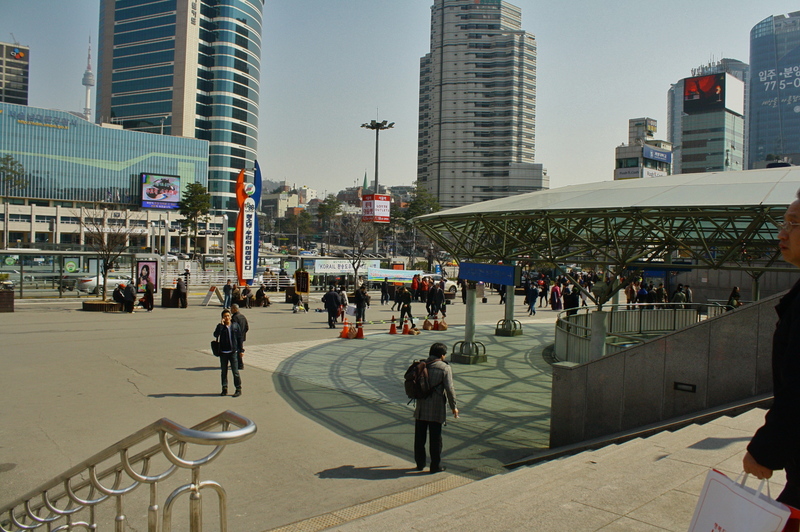 Wide area in front of the station. I think those sitting near the road are homeless guys. I just love the contrast of that orange-brown building with all the blues. Let’s try the usual. 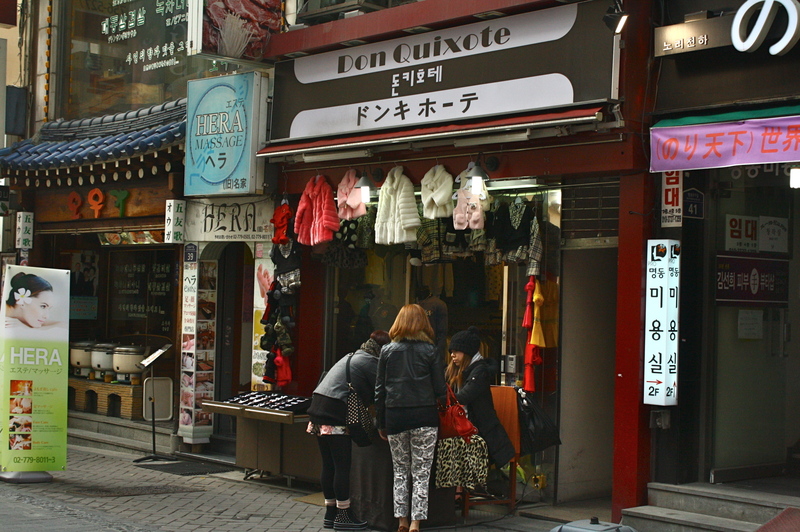 After a few minutes of walking and taking some photos, I spotted the Lotte Outlets and Lotte Mart beside the plaza. I got excited at the sight of a supermarket! I personally find it fun allowing myself to get lost in many shelves with unknown labels of just about anything. So though it was not part of the plan, I checked it out. Of course, I did not expect anything unusual but that was what I was aiming for at that time – the usual. 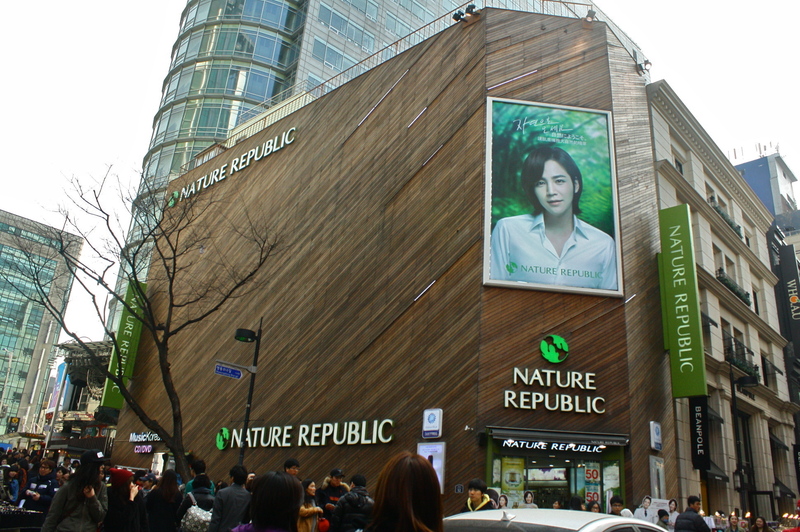 A funny thing I noticed though is that even in supermarkets like this, Nature Republic etc stalls were present. These beauty shops are really everywhere! I wanted to do some food shopping but thought I would just come back some other time because I did not want to bring bags of finds when I meet with family later that day. Also, I could just imagine the lines being long because that was a weekend. I was distracted with the supermarket shelves that I almost forgot I was hungry. 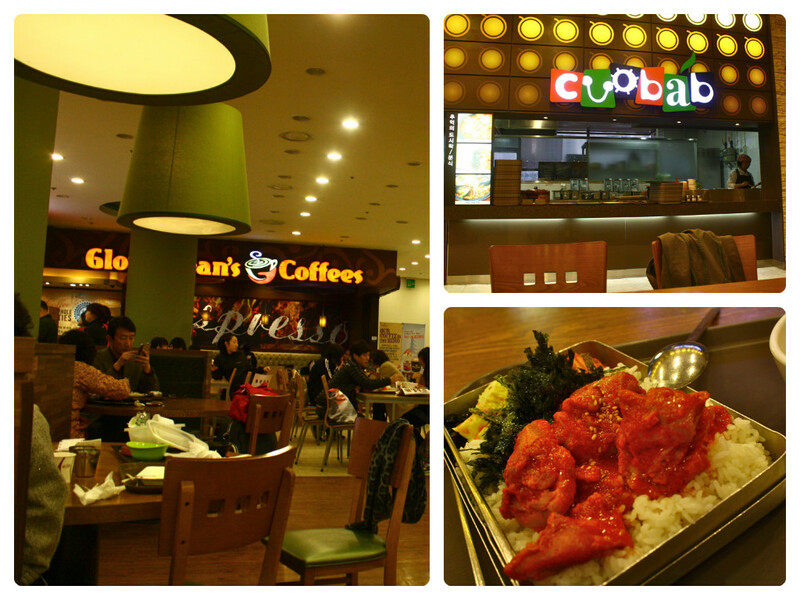 I kept on walking until I saw their food court. Though I know I am up for some heavy dinner later, I still ate my late lunch. 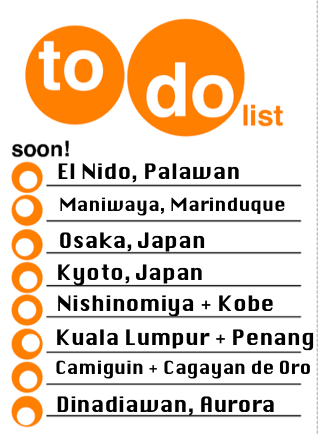 I am pretty sure it is the same in other countries but compared to Manila, food court there was different – good different, that is. I ordered and paid in a counter upon entry then I was directed to a stall where I would claim my food when my number was called. That was kind of some system in there. I ordered some spicy chicken meal for KRW 6,500 which I thought was reasonable enough because it was quite a big serving. Not part of the plan but I got excited to check out their supermarket! 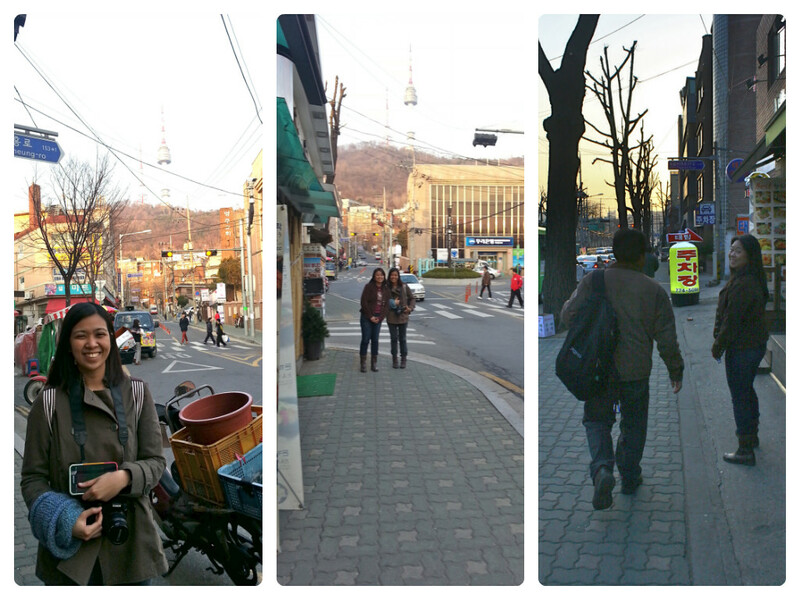 After eating, I headed out to Myeongdong where I was supposed to meet my aunt and uncle. 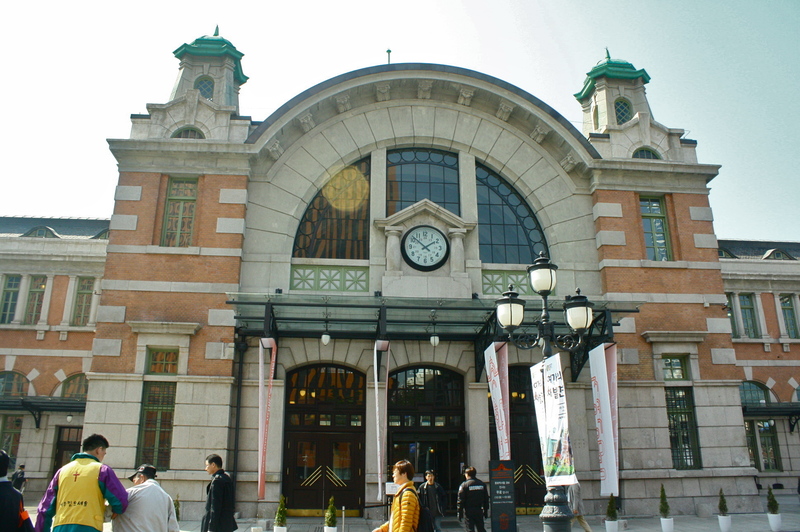 It was a bit early for our 5:30PM meet-up time but I thought I could go there a bit earlier to still try looking for Infinite Lightstick, buy serum for my mother and visit as well Myeongdong Cathedral which was also seen in another Korean drama I like You Are Beautiful. I decided to go to the cathedral first so I tried a different exit (Exit 8 instead of the 6th). 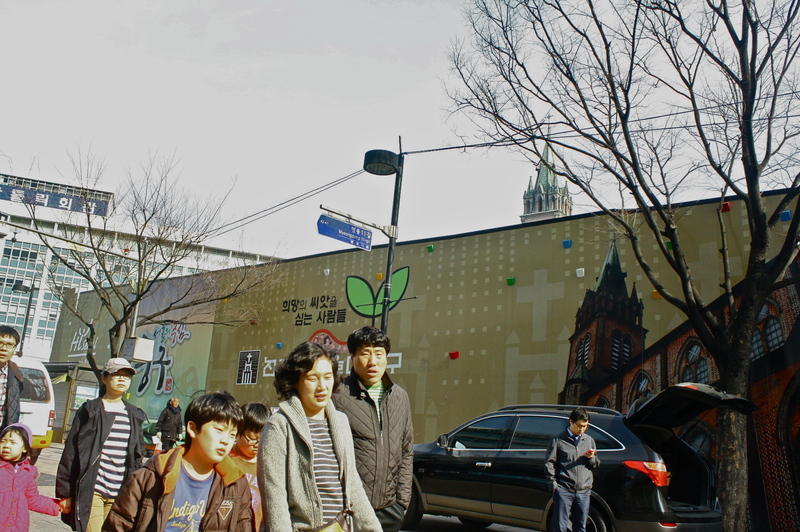 I was confident that I could easily find Myeongdong Cathedral but as expected, I was again lost – big time! 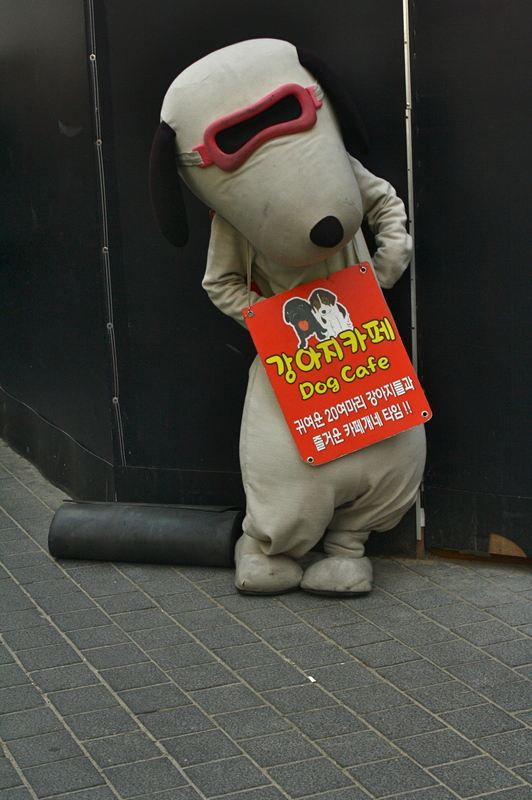 After walking straight ahead for a few minutes, I turned left and saw this! Whoa. 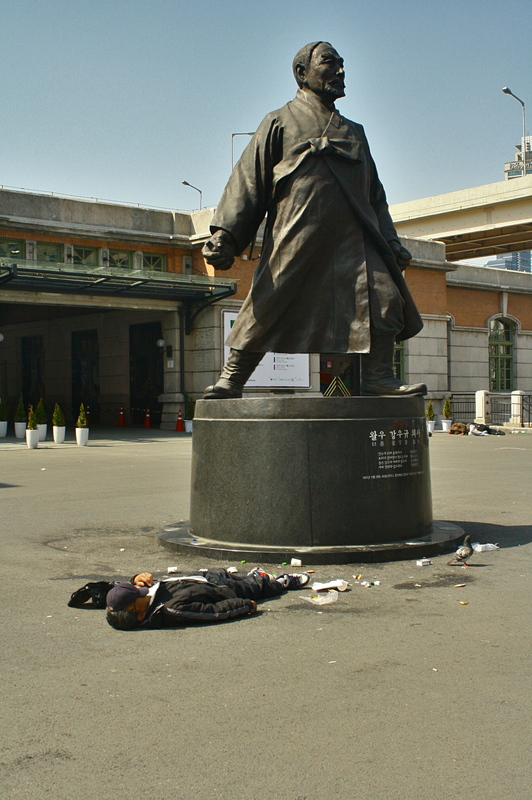 It is you again, Jang Keun Suk! 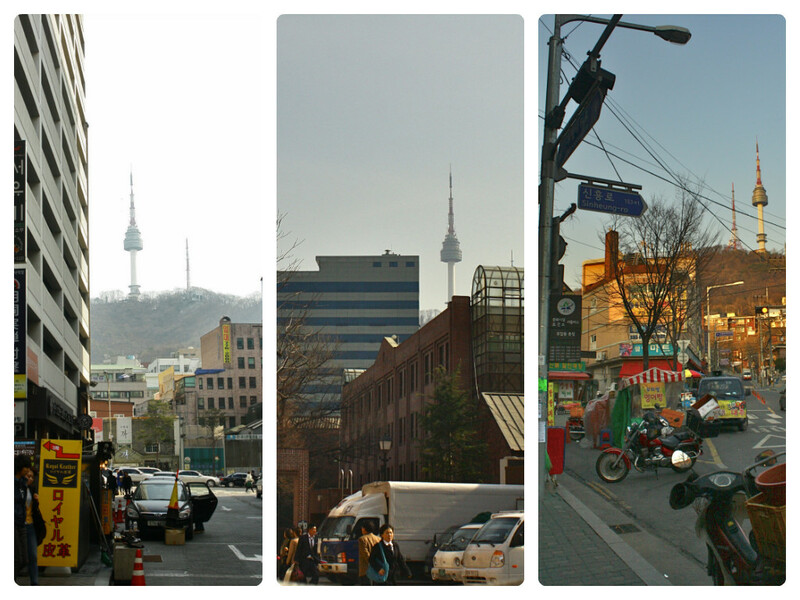 So I just kept on walking and it made me realize how complicated Myeongdong is than I initially thought. I got lost many times. And again, never trust beauty shops as landmarks. 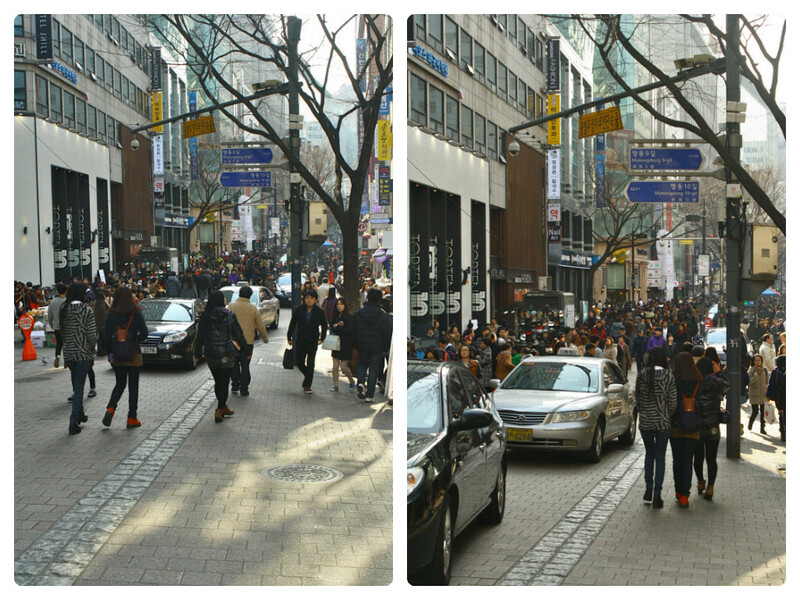 I also immediately realized how much more crowded Myeongdong can be on a weekend. I could not tell whether it was just relatively warm that day or there were just too many people – locals and tourists alike. 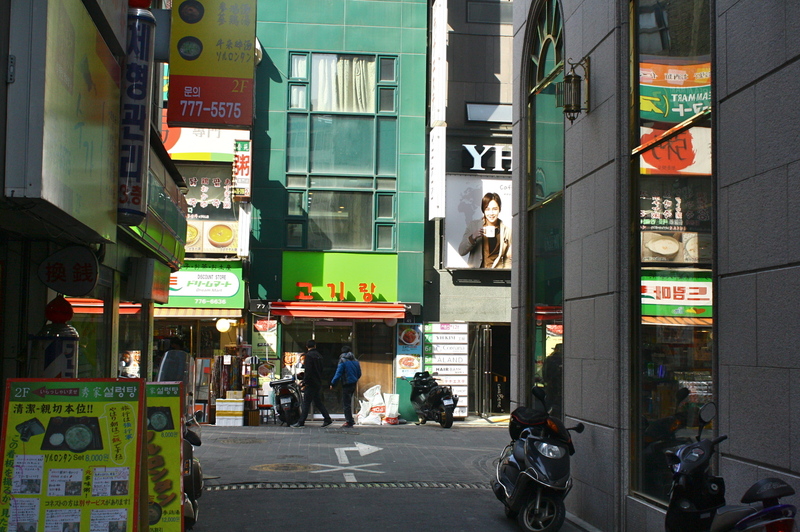 Probably the biggest in Myeongdong. Also where I had a debate with the sales lady because I kept on telling her I really saw a serum in a blue bottle. Turns out I was wrong! He or she posed for me!! S/he looked dirty but still cute! 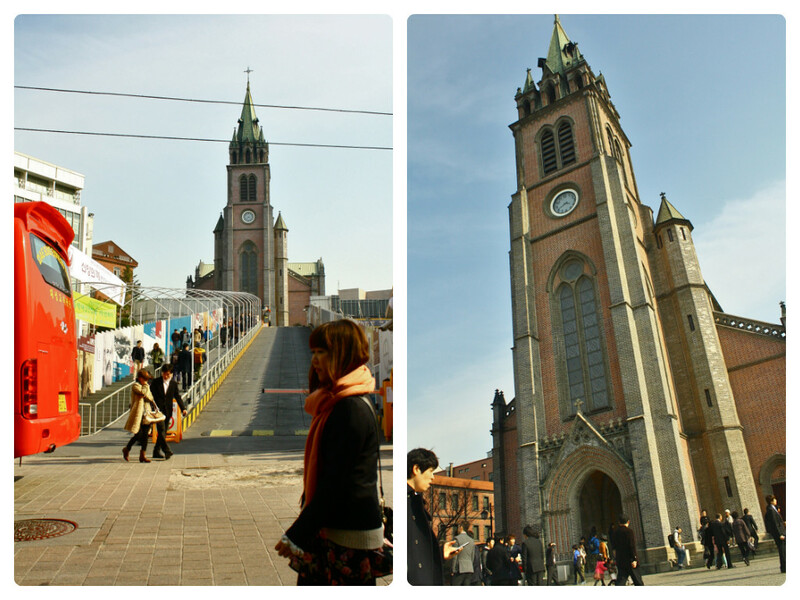 It took me two rounds of walk around certain part of Myeongdong before I accidentally found the cathedral. As mentioned earlier, my interest in the cathedral lies in that a scene in one of my favorite Korean dramas was shot with the cathedral in the background. 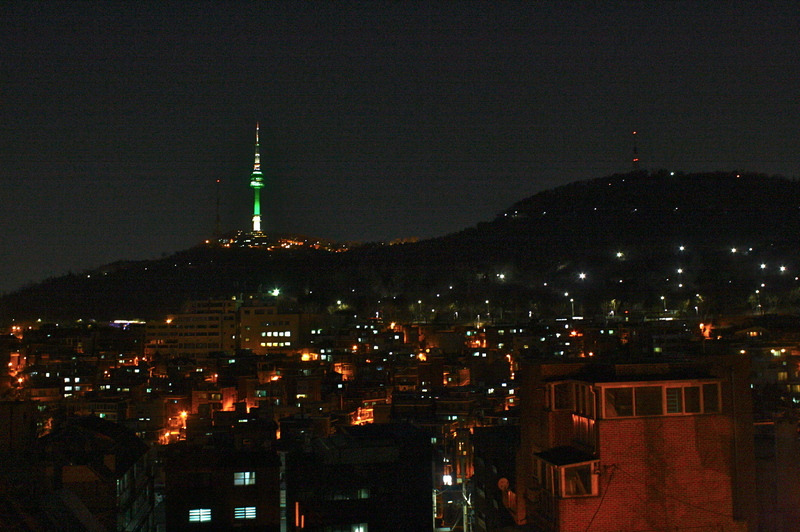 Interestingly though, I later on learned that the church is actually the main Catholic church in Korea. 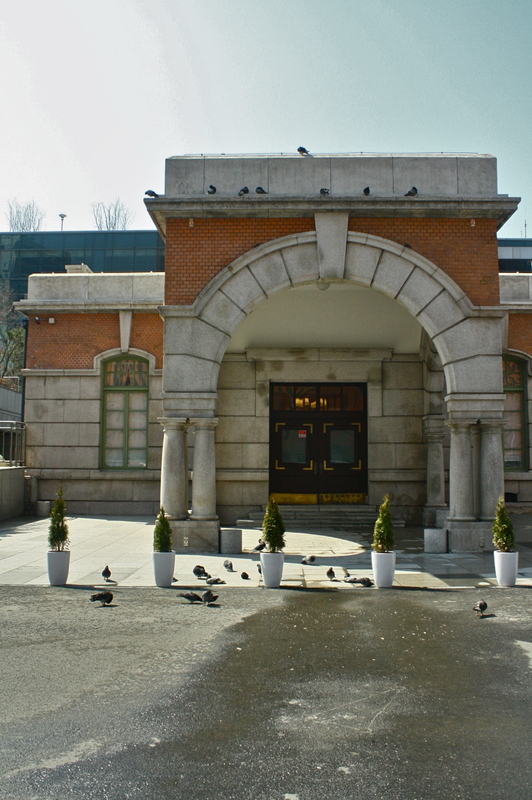 Though it was constructed near the 1900s, it looks relatively new both from the outside and the inside. I specifically like the high ceiling and the long aisle. 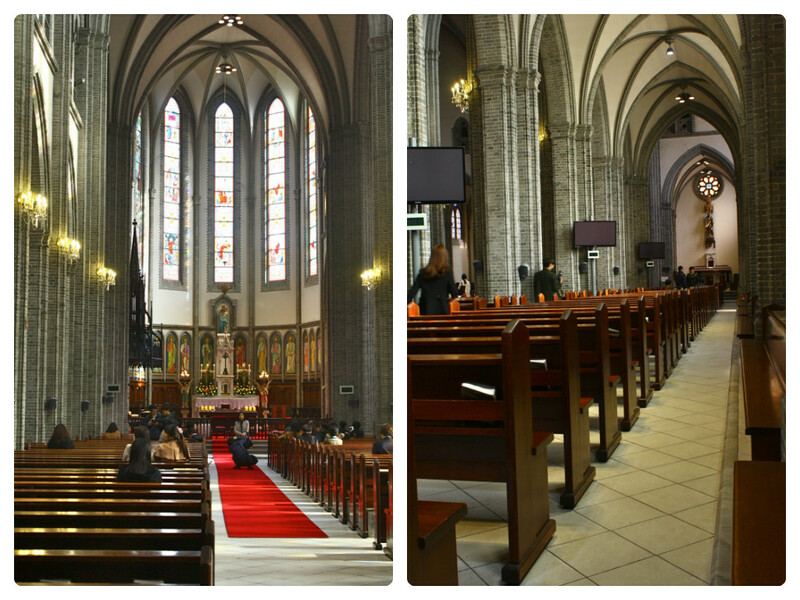 The latter is really one of the first things I notice when going inside a church because I like to imagine brides walking on that aisle while the groom waits for her. (Haha I am still a hopeless romantic!) And I was lucky because I think there was a wedding on that day because I saw a bride. However, unlike the weddings I am used to where the bride walk toward the altar is a big deal, the bride just came inside. 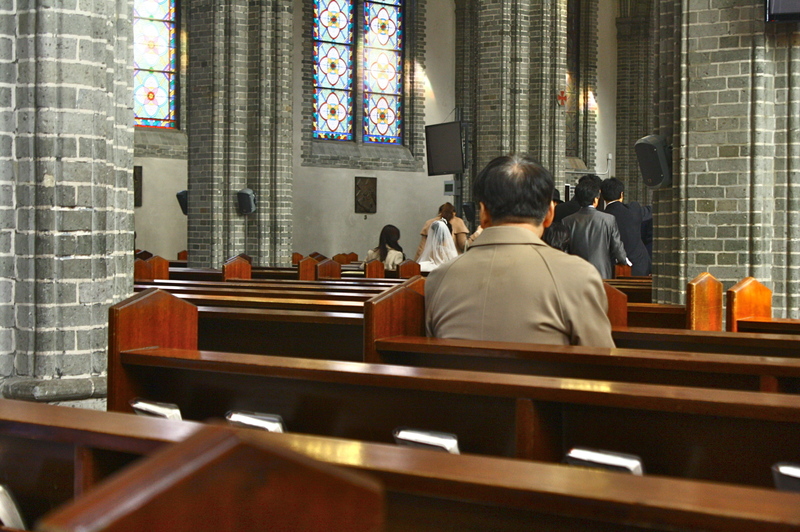 Later on, I realized that it may be because in Korea, the wedding happens not in the Church but in a wedding hall. But still, I was just happy to see a bride! It is also my belief to utter a wish when entering a church for the first time. 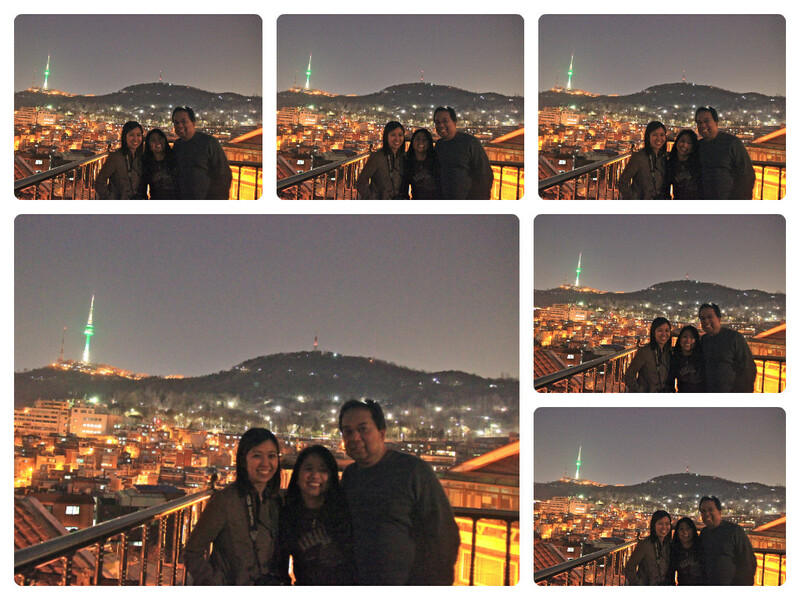 And I did say my wish in Myeongdong Cathedral. I actually forget what I wished for. But I do hope it gets granted! 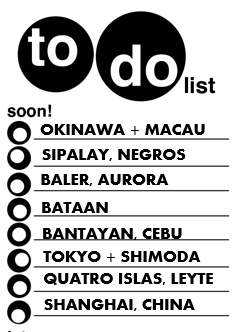 Would it not be sweeter for that wish to come true without me even remembering that I prayed for it? It was when I saw this banner that I knew the cathedral was nearby! There’s the cathedral! It was hard to take a picture of the entire structure. And there was the bride! After going to the cathedral, I still had time before our meet-up so I decided to go Caffe Bene because I saw earlier that Jang Keun Suk was endorsing it. 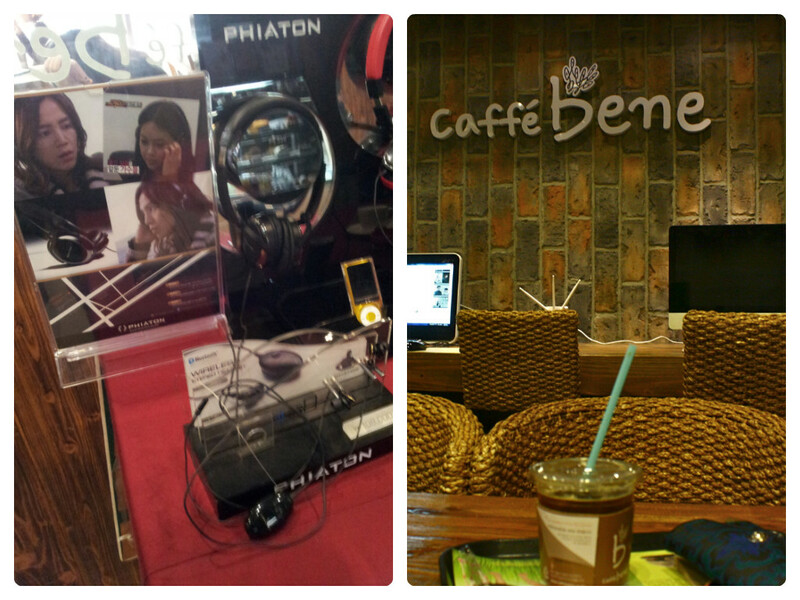 It was like being in a maze again before I finally saw the cafe. I was up for something cold and not sweet so I opted to try Iced Americano. I don’t know why I craved for something cold despite the cold weather. Maybe because it was a bit warm that day compared to previous. I kind of understood then why some people like to eat ice cream even though it was cold. Sat down again finally! And again, Jang Keun Suk! 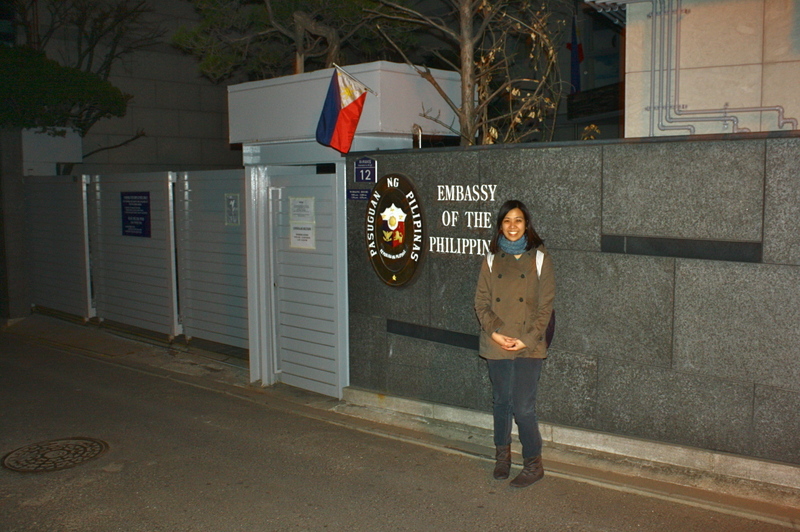 It was about a quarter past 5 when I started walking again to UNESCO Building where I was supposed to meet my Tito and Tita. I waited there for a few minutes just people-watching. Then off we were to an activity I find exciting – riding the bus! 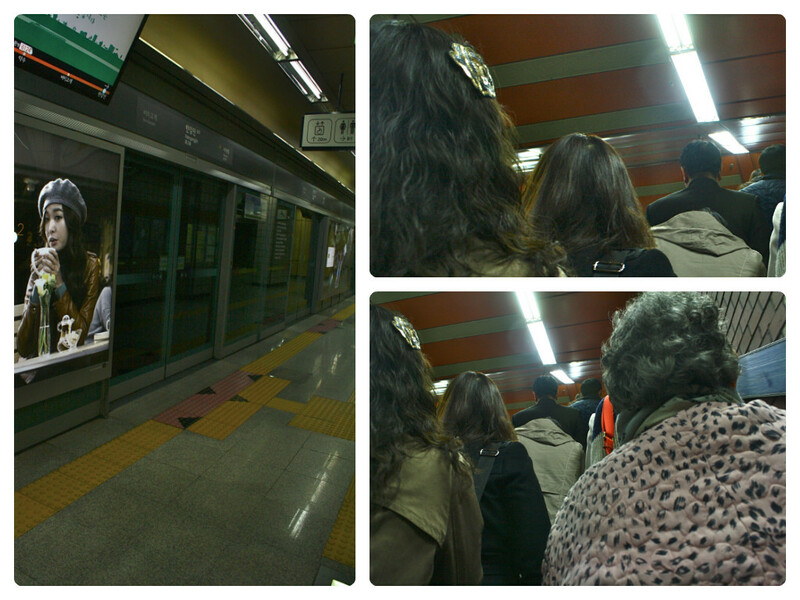 I always been less scared to take the subway because the trips are anytime and there are signs in English but I was so scared with the bus. I do not know about the tapping of the card, the stops, the bus colors or which colors lead to where. 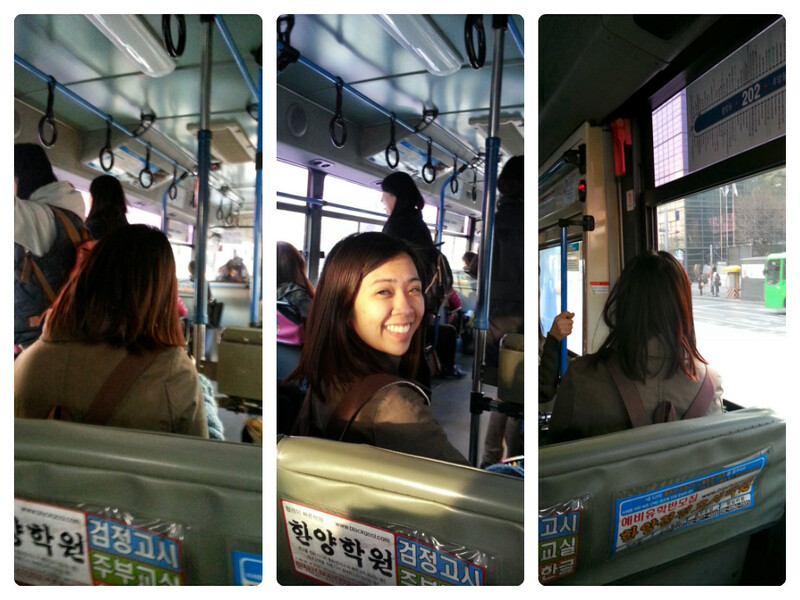 It was strange I know but the bus ride is one of the many things I want to experience in Seoul. Definitely one of that day’s highlights! Where the green bus dropped us off. 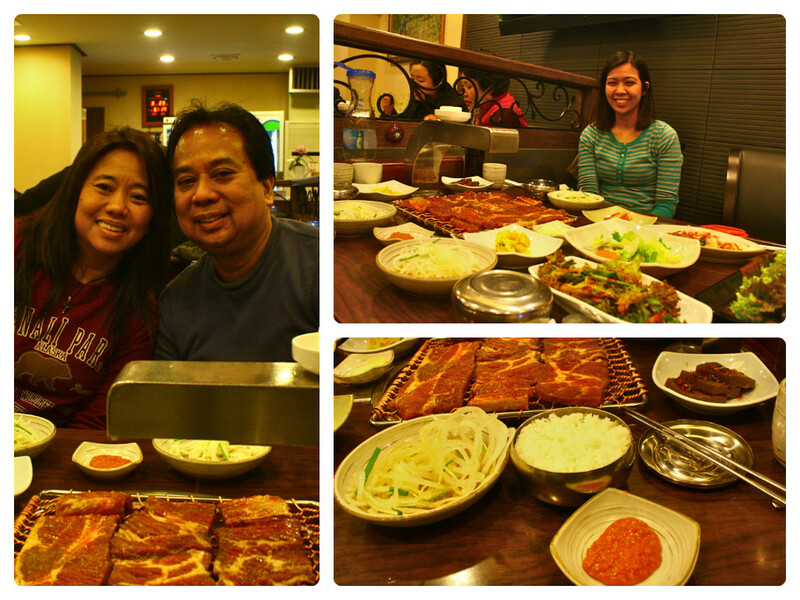 Tito Randy and Tita Judith treated me to an authentic Korean dinner – samgyeopsal. I have read somewhere how samgyeopsal is actually made up of three Korean words – “sam” meaning three, “gyeop” meaning layers and “sal” meaning flesh. 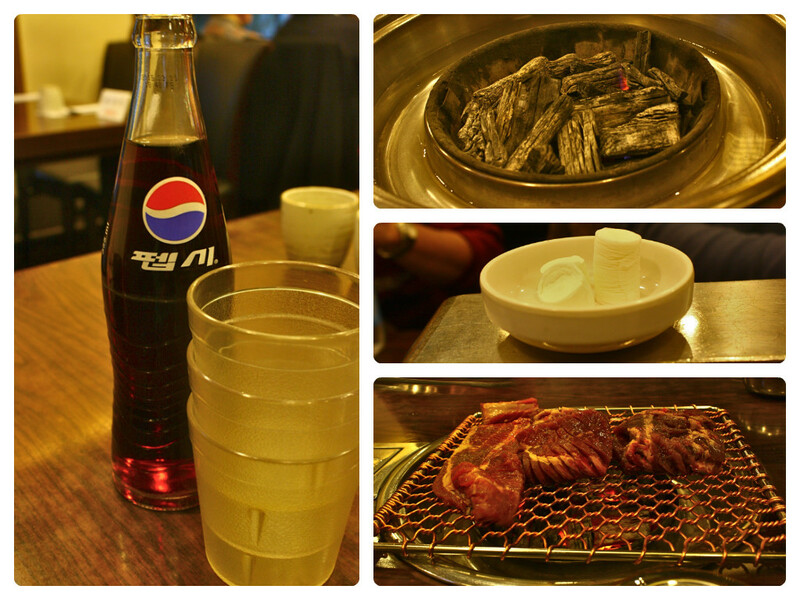 Meal is named such because one can see the three layers of meat in those pork belly slices. Uncooked samgyeopsal. Looks yummy already! Meat is love. Meat with all the accompaniments. I am no veggie fan but I love the vegetables here! 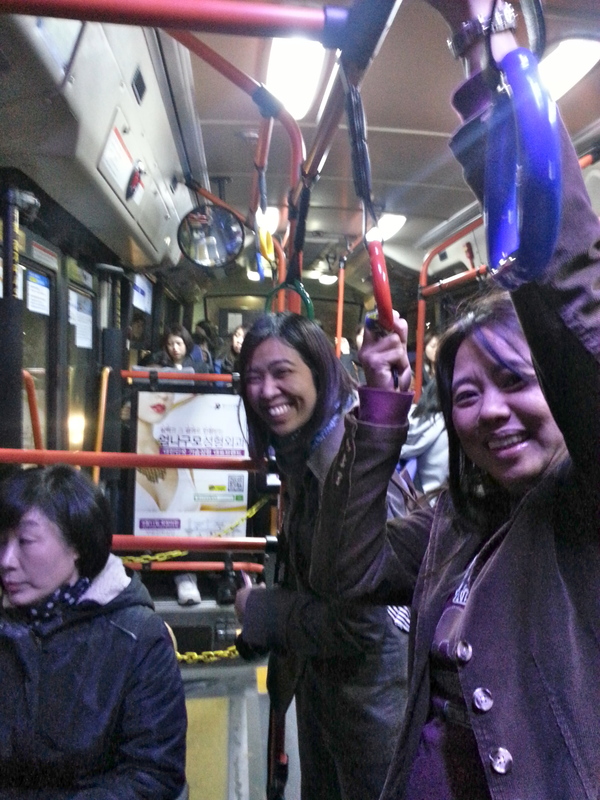 After dinner, we headed to Tito and Tita’s apartment so we had to take the bus again. It is true what they write online, one must hold for dear life because the drivers can drive fast and quite insensitive to passengers. The hilly roads in the area made it more challenging and fun! 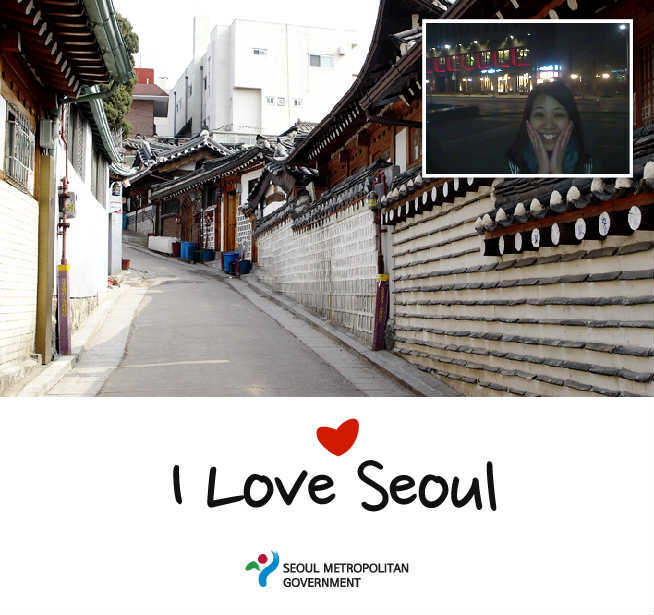 We went down at Grand Hyatt and walked in the quiet neighborhood which according to my Tito, is a typical Korean neighborhood. On our way there, we passed by certain establishments that look like residential areas but are actually expensive restaurants visited by celebrities because very private. 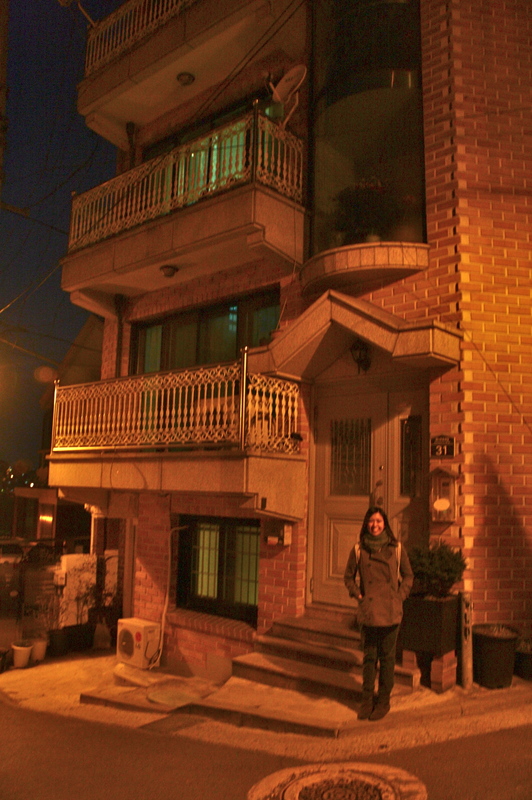 We also passed by a house where a shoot was ongoing. Waaah. Such an exciting night for me! 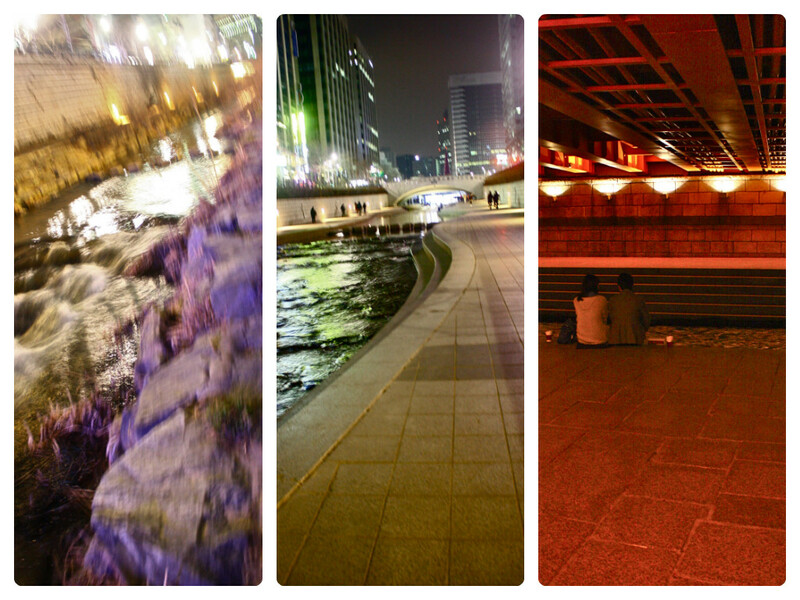 After resting for a while, we took a cab to to Cheonggyecheon Stream. 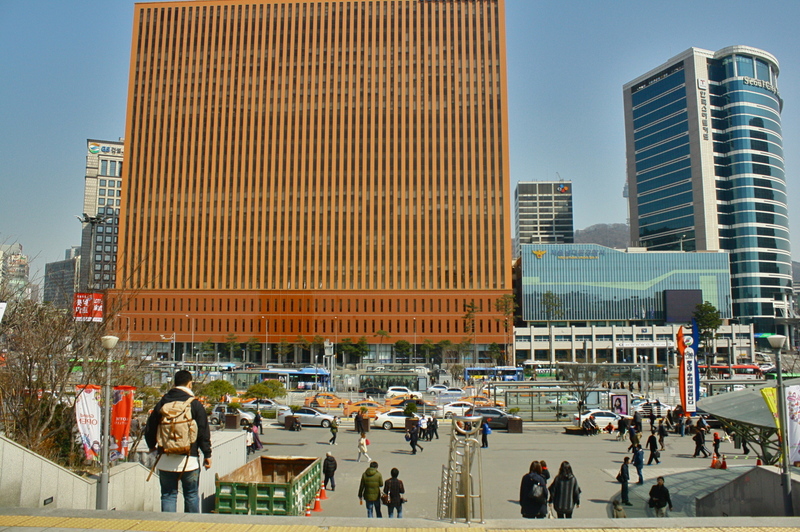 We started from the end of the stream, which is near their office, if I remember correctly, near Dongdaemun. It was cold that night and it was quite a long walk but I had fun walking while chatting and taking pictures with Tito Randy and Tita Judith and watching people, even locals (mostly lovers) take photos as well. I just had to keep my then already freezing hands inside my coat’s pockets. We were initially wondering why there was little light in the stream. We almost gave up on going farther until we saw from a distance a lighted falls. 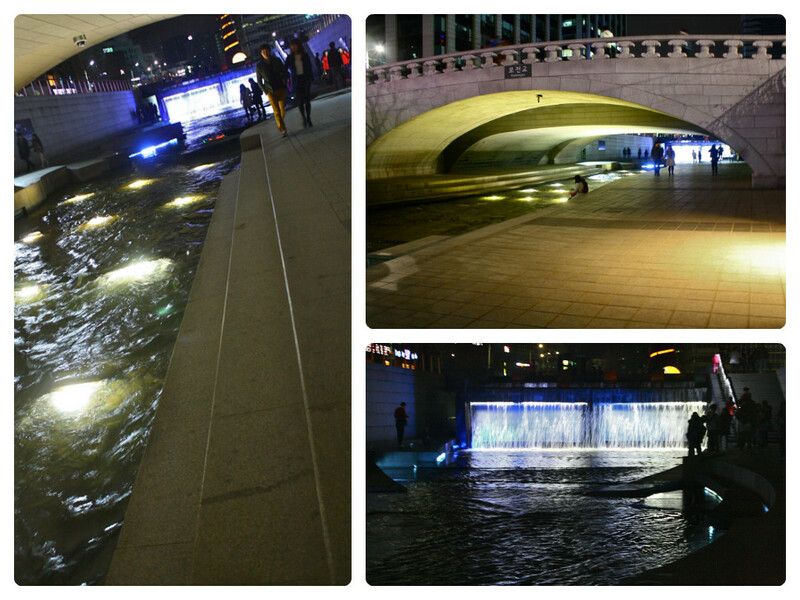 It turned out that that was the beginning of the stream – the one that was near the plaza. The lights were shut off even before we could take a picture up-close but at least we were still able to see it. Just a brief background on the stream (care of Tita Judith), it was restored recently (sometime in 2000) and they even had to remove an elevated highway in the area. It was said to be a controversial project as its cost was quite hefty as well as the labor that had to be put into it because they even had to pump water into the stream. 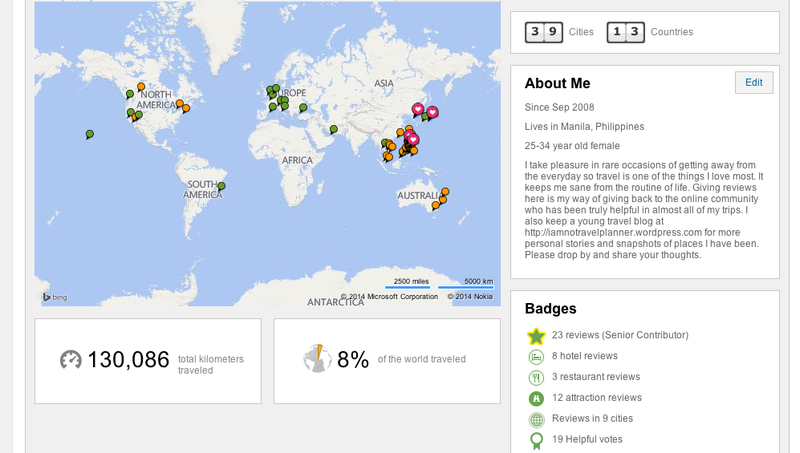 Nonetheless, it seemed like a popular destination now for both tourists and locals (mostly lovers! haha) alike. 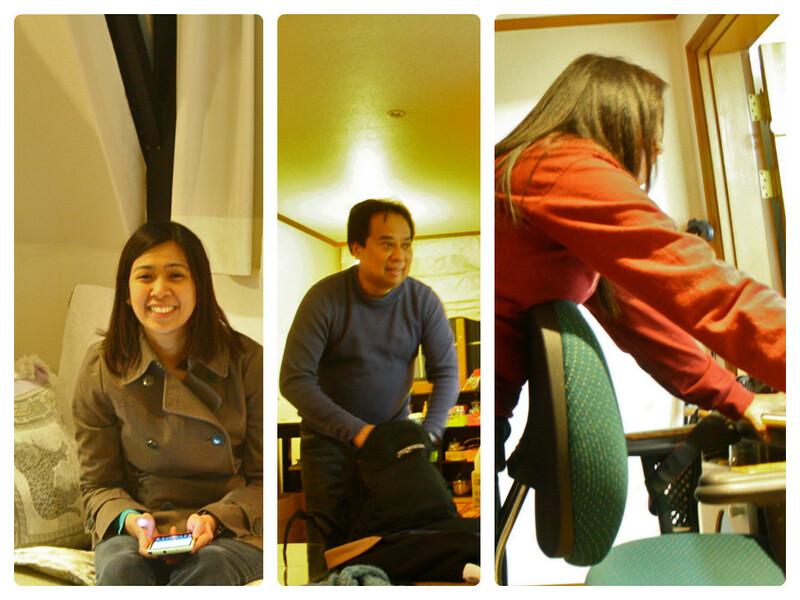 It was so hard to take a decent picture given limitations of my camera but here are few less bad ones. 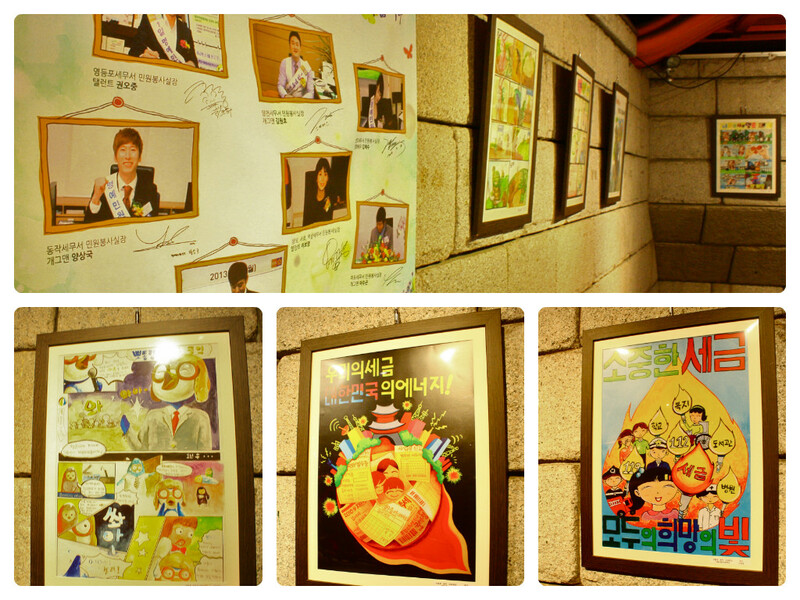 Found this exhibit near Cheonggye Plaza, which I think displayed entries to a drawing competition. Near the beginning of the stream but end of our journey, Tita Judith discovered this photobooth where you can choose a background and take your picture and email it to you or a friend. Photos are below but we also emailed photos to my father and my other aunt and I am yet to ask for a copy. Not the day envisioned weeks ago, but it turned out great! 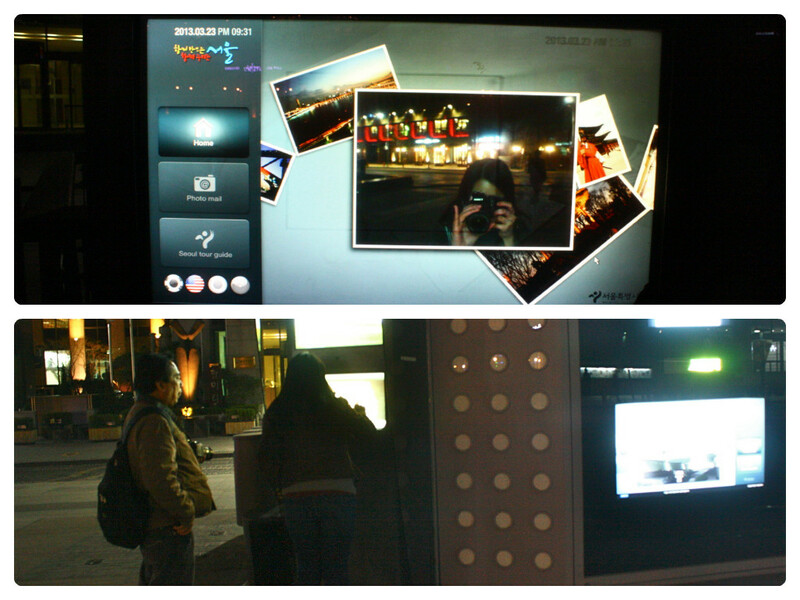 Next time I go there, I would like to try more of the usual such as watching a movie, going to the karaoke (noraebang!) and trying out the sauna. I cannot wait to go back!